A Hollywood production of a film is never a truly successful affair and you can quickly find several examples of amusing situations when you browse the internet. 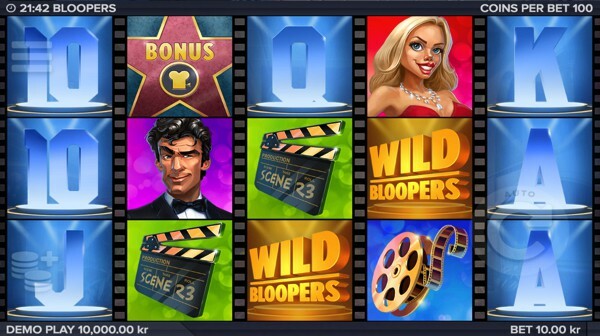 Developed by Elk Studios, that’s what the Bloopers video slot is all about. The Bloopers slot game is presented on 5 reels, 3 rows and features 243 ways to win. The game features a rather interesting introduction video, setting the theme of the slot game and boasts with a list of bonus features including wilds, scatters, several mini games and a free spin feature with a top paying jackpot bonus of 600 times your stake. The background takes place in front of an old hotel lobby. However, the large symbols take up most of the reel space and introduces numerous characters to the storyline. The five reels are separated by film tape and each time you spin the reels, it sounds like an old projector wheel busy showcasing a classic film to an audience. The high valued symbols include a gentleman dressed in a suit, a beautiful blonde dressed in red, a clapper board and a golden reel of film. The lower valued symbols include your usual p10, J, Q, K and A from a deck of playing cards, decorated in blue and white. Bloopers has an excellent array of betting options available to slot enthusiasts and novice slot players alike. The minimum bet you can place on a single spin starts at $0.25 and can be increased to a maximum of $100.00 for the more advanced slot players out there. The golden wild bloopers icon acts as the wild symbol and will substitute for all other symbols except the bonus star symbol. The Walk of Fame star icon represents the scatter symbol and is also the key symbol to unlock the main feature within the slot game. Sound Tech: Provides a few sticky wilds on the reels and rewards you with a free re-spin. Stunt Man: Will transform any wilds into expanding wilds. Fit It: Transfers symbols around the screen to create more winning opportunities. The free spin feature is triggered when you manage to land three or more star scatter symbols on the reels from left to right. Every star will also display a logo for a specific blooper that will be activated during the free spin feature. The female and make leads will transform into sticky wilds and as soon as reels two, three and four are completely filled with sticky wilds, the free spin feature is over. This is another creative and interesting game from Elk Studios, featuring high-quality graphics and well-designed bonus games. The video slot provides a low to medium volatility level, providing frequent pay outs with smaller win values. The Return to Player has also been set to 96.10% to give you more regular wins with every spin you initiate on the reels. Bloppers is a game that has been developed by ELK Studios. You can find it at casinos such as Cashmio Casino and Casino Room. We have embedded a demo version of the game below so that you can try it for free.